…That “if Neolithic man could make flat bread, odds are just about all of us can too.” Clearly, this man has not witnessed my struggle turning flour, water, sugar, and yeast into bread. But I decided that it couldn’t possibly hurt to start small with baby bread steps to try and rebuild my shattered confidence. So I put on my happy face and gave it another shot. Although there is a quick version of this process, I decided to let the dough rise overnight in the refrigerator. At first I would take a peek every few hours and make sure that the dough hadn’t escaped the bowl and creeped its way, blob like, all over the place. Assured that my milk and yogurt were safe from creeping pita dough, I checked Step 1 off the list. Step 2 had me worried. When I took the dough out to warm up, it looked very wet. Which, from my limited experience, meant sticky. Which meant messy. Digging into the dough, I was pleasantly surprised. Yes it was good and moist. And it had risen almost to the top of the bowl, so it was at least to three times its previous size. But it was not overly sticky. A light dusting of flour on my hands was enough to keep me from becoming encased in pita dough. I did have to enlist The Mistah’s help to retrieve the kitchen scale and a plate since I hadn’t though to get them before I was wrist deep in the bowl. Understanding the language of dough is important in Step 3. Once the portions have been formed into balls and rested, it’s time to roll. If you find that your dough keeps pulling back and shrinking instead of growing into larger circles, it hasn’t rested enough. The gluten needs more time to relax. Put down the rolling pin and walk away for 10 to 20 minutes. Have a cup of tea, read the paper, check your email, or take the dog for a walk because it’s futile to fight the dough. Trust me on this point, please. After the dough had been rolled out, it had to rest again. I know, it seems like a lot of steps but the actual work involved in all this is minimal. This was a good time to get through whatever 30 minute show happened to be sitting unwatched on the Tivo. By the time the show was over, because I do fast forward through the commercials, the dough was ready and the oven was screaming hot. I cannot overstate that last point enough. Your oven is at 550 degrees. Your baking stone, unglazed ceramic tile, upside down baking sheet, or whatever you’re using as the cooking surface is dangerously hot. Homemade pita is nice and everything but it’s not worth a trip the ER with third degree burns. If Steps 1, 2, and 3 felt like a lot of hurry up and wait, Step 4 made it all worthwhile. The moment I had two pitas placed on the baking stone and closed the oven door, the magic started. They started to bubble and then in the blink of an eye, they were puffing up like pillows. So that’s how they get the pocket in the pita bread. One quick flip and in less than five minutes I had steaming hot pita bread cooling on a rack. When everything was said and done, not all of my pitas came out looking perfect. But they all came out edible. So maybe Joe Pastry was right after all. BAH Note: I added a step to JP’s recipe. One of the recipes I had previously tried called for a rest before the dough is kneaded. Cook’s Illustrated called it autolysis. They said, “In autolysis, the dough is mixed and then allowed to rest for 20 minutes before it is kneaded. As the dough autolyzes (rests), enzymes naturally present in wheat act like scissors, cutting the balled-up proteins into smaller segments that are easier to straighten during kneading. This is why dough that has undergone autolysis requires much less kneading than freshly made dough. In addition, the more water there is, the more efficiently the cut-and-link process takes place. All you need is extra time and moisture, and chemistry will do the work for you.” I say, if you have an extra 20 minutes or so, you might want to consider letting the Food Science Fairy do its thing. Combine all the dry ingredients plus olive oil in the bowl of a mixer fitted with a paddle attachment, and stir on low to combine. Add the water and continue stirring for about 30 seconds, until all the ingredients are moist. Switch to a dough hook and knead until the dough is smooth and elastic, 5 to 7 minutes. Let rise in an oiled bowl for an hour or refrigerate the dough overnight (Pastry Joe says this results in the best flavor). When ready to bake, remove dough from the refrigerator and let it warm for about 30 minutes. Place a rack in the lowest position in the oven and remove any other racks. Place a baking stone on the rack and heat the oven to 550 degrees. Turn the dough out of the bowl and divide it into nine, 3 ounce, pieces. Roll each portion into a ball and let them rest for 20 to 30 minutes. Roll the balls out to circles about 7 inches across and let them rest for another 10 to 20 minutes. When ready, pick up a pita and drop it onto the baking stone. Bake until it puffs up, approximately 2 to 3 minutes, then carefully turn it over with tongs. Bake another 2 to 3 minutes or so, until the pita achieves the desired color. According to Pastry Joe, the lighter the pitas the more tender and flexible they will be. Cool completely and eat. I individually wrapped most of the pitas in plastic wrap and wedged them into the freezer for long term storage. You braved the yeast again! Mon dieu! TKW, I’m starting with baby steps in my journey to make friends with yeast. My oven is far from spotless. Remember, I make bacon in there…and grease splatters. But even at 550 it’s ok. Just remember to disable any nearby smoke alarms. And if you’re especially nervous, run the overhead exhaust or open a window. This would be a fun recipe for the girls to watch…from a safe distance. How scary was it to work with 550 degree oven? My oven and my smoke detector start to fight when I try to cook above 500 degrees (Noel gets stationed under the smoke detector with a pillow) so I’m always a bit scared by a recipe with a temp this high. Step number one of this recipe should be – Remove the battery from your smoke detector. That’s the only way to keep the thing from wailing. As long as I remember to be careful, I’m fine. Just opening the oven door to flip the pita is a pretty good reminder not to mess around. And tongs are essential to this process. An oven mitt wouldn’t hurt either. Bread is such a satisfying endeavor when it works out. Excellent job…they look wonderful! Thanks Tracy, I’ve been enjoying these little goodies. They keep very well in the freezer. 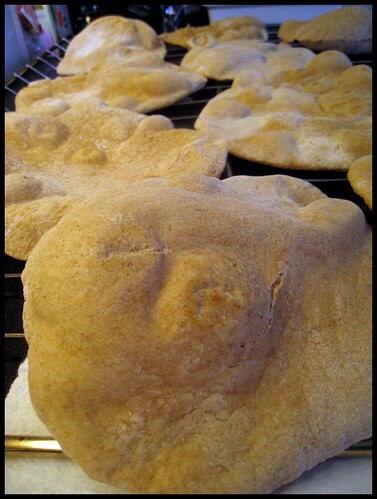 Once the holidays are over and my oven is not otherwise occupied with baking treats, I need to make another batch of pita. Wow! They look awesome. What did you eat them with?? Elizabeth, I throw these into my lunch bag. Matter of fact, I have one in my lunch today. They like to be paired with Trader Joe’s roasted red pepper hummus. yummm roasted red pepper is a good one. my favorite hummus is the sabra pine nut! Emily, the pita part isn’t that scary. It’s a whole lot of hurry up and wait though.